It is my belief that the Constitution is an inspired document akin to scripture. As Latter-day Saints we ought to be particularly mindful to defend its principles, knowing that the failure to do so will lead to our destruction. This is the message and warning of the Book of Mormon to the Gentiles who have inherited this land of promise. A man I respect greatly recently admonished that “If you can see the problem, you should speak up. Help others to understand the path we are on will end with collapse and violence.” He was addressing other issues, but I think the advice to speak out applies to ALL topics affecting our Constitutional freedoms. The following letter was written and sent to the First Presidency. I share it with permission from the author who wishes to remain anonymous. I think the letter is outstanding and lays out a very compelling argument that needs to be heard and considered. I applaud his courage and hope the Brethren will not retaliate for his sharing his concerns. I also hope more freedom loving people will express their concerns to the men tasked with leading the church in these matters. I write to you regarding the Church’s position taken in Utah regarding the rights of the religious to determine whom they will hire and to whom they will rent. As I understand, some of the general authorities of the Church influenced the legislature to take the position that it is permissible to force employers to hire LGBT (Lesbians, Gays, Bisexuals and Transgenders) and for landlords to be forced to rent to the same group, even if they object to doing so because of religious reasons. I also believe that the Church similarly supported exempting religious and educational institutions from this requirement. We believe that no government can exist in peace, except such laws are framed and held inviolate as will secure to each individual the free exercise of conscience, the right and control of property, and the protection of life. All subsequent mention of verses will refer to D&C 134, unless otherwise specified. If we believe that the right and control of property is an essential aspect of freedom, why did the Church’s leaders move to restrict such? And if the leaders thought there was some good reason to support such a restriction, why did they exempt their own organization? Are the rights of the People somehow subordinate to the rights of one group which they have created? This section in the D&C talks of the need for the government to respect the conscience of the People. Surely men and women have the right to follow their conscience in this matter. Surely man-made laws, such as public accommodation laws, do not trump God-given laws in this matter. If a person is not permitted to allow his/her religion to inform his conduct in this matter, where is such informing allowed? And what boundaries does the government have to respect? If the right to control property is excepted in this instance, is there really any such right? Verse 7 talks about the need for government to protect the “citizens in the free exercise of their religious belief“. If Latter-Day Saints or Catholics or Baptists feel a need to manifest that belief in their landlord or employer duties, is not the government duty bound to protect them? Is it not their property/employment position? Do they not have the right to determine to whom it goes? And if it does not go to a certain individual, the latter’s rights have not been violated because it is not their property or position. Why, then, have you supported the government violating its duty? And while this law supposedly applies to members of all religious societies, so that all of them are affected, has not this law enabled the denial of individual rights of the members of all societies, which is spoken against in verse 9 (We do not believe it just to mingle religious influence with civil government, whereby … the individual rights of its members, as citizens, [are] denied)? Verse 10 talks about the conduct of religious societies, how they have not the right to “try men on the right of property“. Yet it seems to me that you have done just that, only using the arm of the law to accomplish what by scripture you could not do. If you thought the act of denying rentals or jobs to LGBT was against our religion, why did you not simply excommunicate the offenders, or instruct stake presidents and bishops to do so? This action, that you have engaged in, is sad from another perspective. Normally men/women are to appeal to the civil law when the right of property is infringed (verse 11 – We believe that men should appeal to the civil law for redress of all wrongs and grievances, where personal abuse is inflicted or the right of property or character infringed). But what does one do when the infringer is the law itself? Furthermore we are warned to not engage in sedition and rebellion, while protected in our rights (verse 5 – We believe that all men are bound to sustain and uphold the respective governments in which they reside, while protected in their inherent and inalienable rights by the laws of such governments; and that sedition and rebellion are unbecoming every citizen thus protected, and should be punished accordingly). So what are citizens to do when the government itself is the aggressor and offender of rights? 4 And now, verily I say unto you concerning the laws of the land, it is my will that my people should observe to do all things whatsoever I command them. 5 And that law of the land which is constitutional, supporting that principle of freedom in maintaining rights and privileges, belongs to all mankind, and is justifiable before me. 8 I, the Lord God, make you free, therefore ye are free indeed; and the law also maketh you free. 9 Nevertheless, when the wicked rule the people mourn. 10 Wherefore, honest men and wise men should be sought for diligently, and good men and wise men ye should observe to uphold; otherwise whatsoever is less than these cometh of evil. 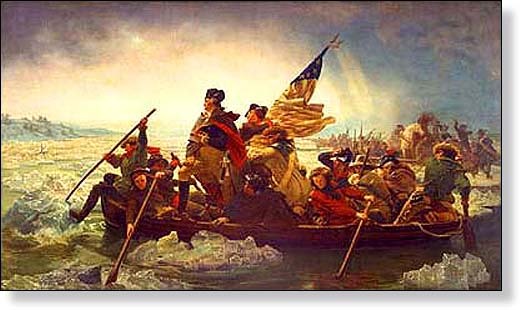 54 Have mercy, O Lord, upon all the nations of the earth; have mercy upon the rulers of our land; may those principles, which were so honorably and nobly defended, namely, the Constitution of our land, by our fathers, be established forever. I served my country on active duty for 7+ years in the Army (and later in the Army Reserve) and taught soldiers under my care about the Constitution which we had all sworn an oath to defend and protect. Never in my life would I have imagined that the leaders of my Church, who are acknowledged as prophets, seers and revelators, would become the enemies of that same Constitution which I hold as sacred and which I pledged to defend and protect. D&C 88:81 Behold, I sent you out to testify and warn the people, and it becometh every man who hath been warned to warn his neighbor. Brethren, I want the best for you. Please consider these things. This entry was posted in Main and tagged Accountabilty, apostasy, Church leaders, False Doctrine, Unrighteous Dominion on July 22, 2015 by Bishop Anon. 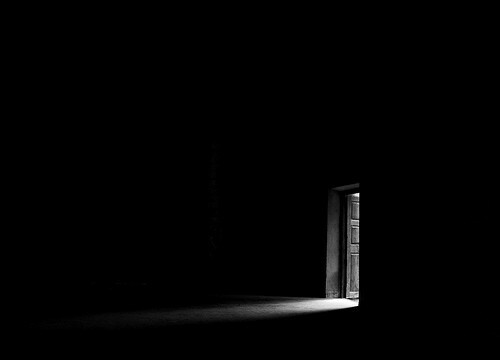 We are commanded to bring to light the hidden things of darkness (D&C 123:11-15) which are found within our churches (Mormon 8:36). Not with railing accusation, that we be not overcome, neither with boasting nor rejoicing, lest we be seized therewith (D&C 50:33). Yesterday I received an email from LDSLiving.com. 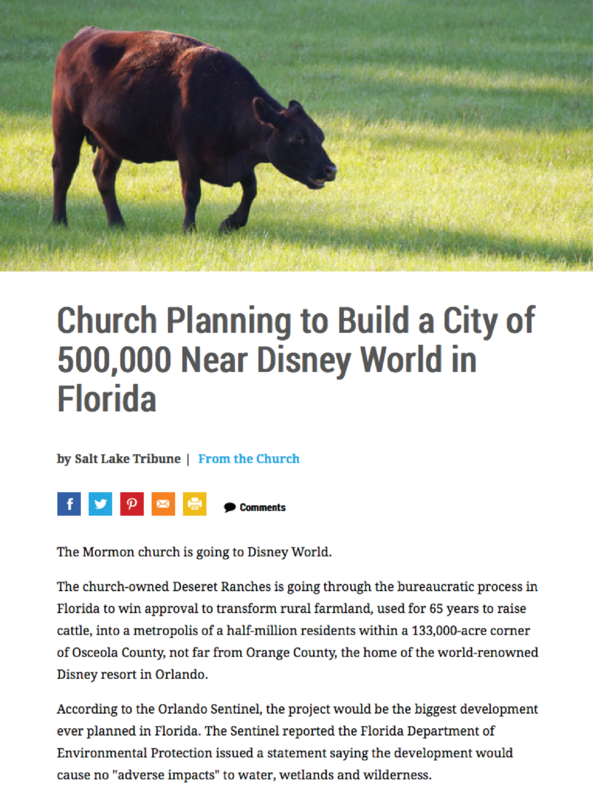 It invited me to click on a link to their website where I could read more about the church’s new plans to build a city for 500,000 people near Disney World. I successfully clicked on the link and it took me to the article on LDSLiving.com as shown below. From there, I was given the option to link to the full story at the Salt Lake Tribune. Curious, I began to read the comments and follow this trending story. I quickly noticed that many others shared some of my initial concerns over yet another speculative business deal by the church using sacred funds which are supposed to be committed to the poor. There were 817 comments last time I checked after only one day in the news. Today I went back to LDSLiving.com to see if any more people had commented on the story there. To my surprise, I could no longer find the story there… anywhere. So I decided to do a Google search to find the story again and this came up in the search results. I clicked on the link again and the link no longer took me to the story, but instead redirected me to the homepage. Obviously the story has been removed from the website completely. Although I still find the other stories which were promoted in the original email from LDS Living and although the story in question can still be found on the Salt Lake Tribune. Why is the church continuing to pursue very large building projects? Especially in light of the controversies surrounding other projects such as City Creek, Philadelphia, New Zealand, a recent $500M land purchase in Florida, etc. Is it because the church is forecasting insufficient earnings (tithing) and believes it needs a new source of income to sustain its growth? What happens if and when these business deals go south? Is the church still completely debt-free as it once used to boast? Why did the church remove its own story from LDS Living? Is it due to the negative comments it began to receive? Is the church afraid of honest feedback? Criticism? Controversy? Is pulling their own news story “good reporting” when the story is dealing with financial decisions the church is making? Does this show leadership? Inspiration? Integrity? If the church is sensitive to criticism and willing to change its positions accordingly, shouldn’t this be all more the reason we, who love the gospel and the church, give our feedback about such projects? Should church members not be entitled to know this information? Why should such questions be considered inappropriate? The church now argues that those who oppose the church on other more important issues such as marriage are able to, respectfully. Why not the same treatment here? These are real questions and real issues for many good people in the church. Let no man count these as small things. Hopefully our continued efforts to lovingly and respectfully request full transparency from the LDS Church leadership will be heard. The Lord tells us the effort is worth wasting and wearing out our lives for. Much depends upon on whether we succeed or not in bringing such things to light (D&C 123:11-15). If you agree the LDS Church needs to be fully, financially transparent please click on the image below and sign a petition created by ByCommonConsent.org. This entry was posted in Main on July 11, 2015 by Bishop Anon.